Material: 95% polyester, 5% elastane. Lining: 100% polyester. Lace: 90% polyamide, 10% elastane. Washing Instructions: Machine wash in bag 30°. 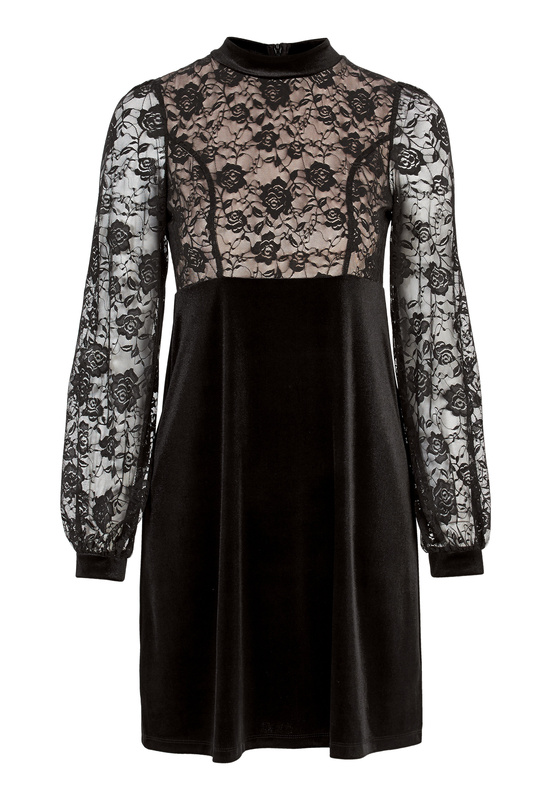 This is the perfect party dress, with a velour and lace quality, from HAPPY HOLLY. The dress has a dividing seam at the waist and a bell-shaped skirt, which provides a flattering fit. The top of the dress has a lace quality and puff sleeves. - Decoratively lined at the top. - The sleeves and skirt are not lined. - Long-sleeved puff sleeves with velour cuffs at the wrists. - High neckline with a velour collar. Front length from shoulder: 92 cm, bust 88 cm, in size 36/38.